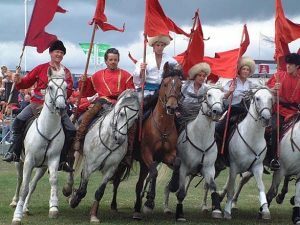 Originating on the Russian Steppe, The Cossacks are famed for their horsemanship in military history. During times of peace, their daring battle techniques were transformed into acrobatics on horseback. The Devil’s Horsemen’s fully choreographed show includes trick-riding, a Roman-riding race, liberty acts, carousel displays and a classical high school dressage display with full commentary and background music. For this show, our team needs physical fitness, gymnastic ability and a horse who enjoys tearing along at a full gallop, while it’s rider performs hangs, drags, vaults, and saddle stands. Please return your forms by Tuesday 23 January 2018.